Seven Brothers is a 35 X 24 inch oil painting. The inspiration for this came for a tale collected by the Brothers Grimm about an evil stepmother who cursed her stepsons, turning them into birds. The only one who could save them was their younger sister who had to take a vow of silence for years and journeyed far and wide to find them. This illustrates the moment when she found them after looking for so long. Diana, the Huntress is a 16 X 12 oil painting done from a live model. I didn't realize at first that I was painting another mythological work. 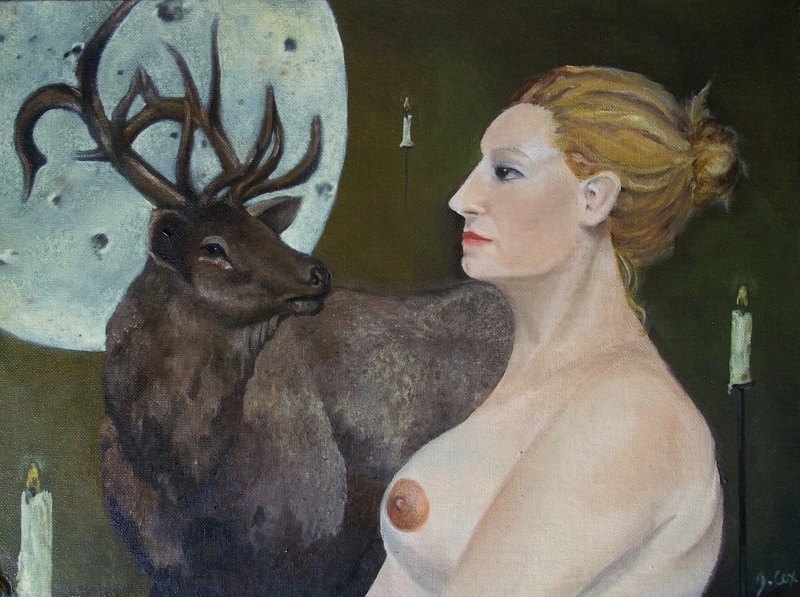 I let the canvas sit in my studio for a couple of weeks with just the woman and the elk on it. I felt the subjects needed some kind of background, but I couldn't figure out what that was. I rejected the idea of the moon initially as I felt it was too cliched, but the work didn't care. It kept insisting on the moon and so I obliged and realized that the goddess Diana, the virgin huntress and deity of the moon, wanted this piece to be about her. Magic in a Fishbowl is a 5 X 7 inch oil painting on paper. This wasn't a planned piece and came together through playing one afternoon with my niece. We were inventing imaginary creatures and decided to paint our ideas. This is my flight of fancy - the unifish. Partners is a 16 x 20 inch oil painting done from a live model over a period of five weeks. Never having painted straight from a model, though I've done many drawings that way, was a new challenge. Of course, I couldn't keep it a straight portrait and felt it needed something so I added the cyborg bird and the alien city elements behind the subject, giving the viewer the sense that this character has a story to tell and perhaps something important to say. I love melding the fantastical with the ordinary, because for me, true reality is a combination of the imagination nestled within the everyday - making life a truly extraordinary journey. This is the largest oil painting I've done to date. 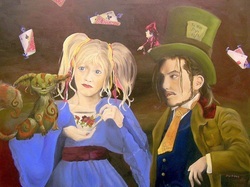 It is an obvious reference to the book Alice's Adventures in Wonderland, and is part of the Concordia University Library's art collection. It was shown at the "Magical Moments in Time" show on the college campus in January and February 2011. 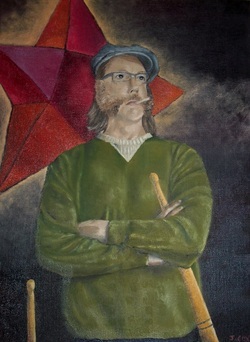 The Hermit is an oil painting on canvas based on the tarot card by the same name. The traditional "hermit" is shown wandering the night world with a lantern, illuminating secret knowledge and discovering inner galaxies inside of himself. His symbols are a staff, a flame and the Star of David. This is a modern version of that same seeker, but here a cigarette stands in for the flame and the oversize drumsticks are his staff. A star continues to light his way. And most importantly to me, this is a portrait of my dear friend, David, which when I began researching this subject I couldn't think of a name or person more appropriate to symbolize the wisdom and searching elements of the hermit than him.